November 2009 – Ben Boyle lives here! …pointed out recently we’ve been being naughty using KB for kilobytes, when it should be kB. k for kilo is the standard (it’s still M for mega, G for giga) and although bits/bytes aren’t standardised b (bit) and B (byte) are in common use and thus recommended. It came up as the team there were debating whether to use KB or kB (not KiB? nobody loves kibibytes it seems). I guess it doesn’t really matter, people tend to understand in either case, and I reckon file sizes should probably be rounded up anyway, so long as they give an approximate guide to downloading. But I can’t help thinking — everytime I see “32 KB” — my, that’s a cold, cold file! (K is for Kelvin in SI units). KB is also my sister’s initials. But I don’t think she’ll mind too much if you use it on your websites! Posted on 26 November 2009 Categories Uncategorized1 Comment on Very cold files! It keeps the code simple in your head. Complexity kills. Simplicity rules. And keeping it simple means it doesn’t take too long, so it isn’t an imposition on your life. And so it is with revision 175 of the forces.forms javscript library, introducing initial support for custom form validation (based on setCustomValidity from the HTML 5 spec). And truly, that’s enough for a light coding session. 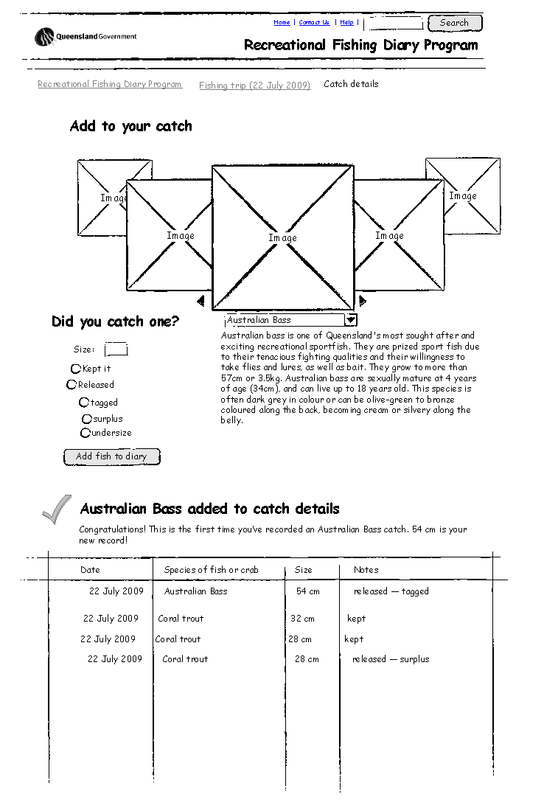 We talk about fishing a bit at work — we did refresh the website for purchasing stocked impoundment permits (SIPS, they are for recreational fishing in Queensland dams) early in the year. Isn’t that form pretty!? 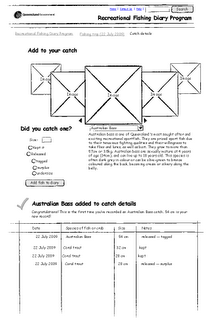 In July, I started some wireframes for a new potential website: an online fishing diary. 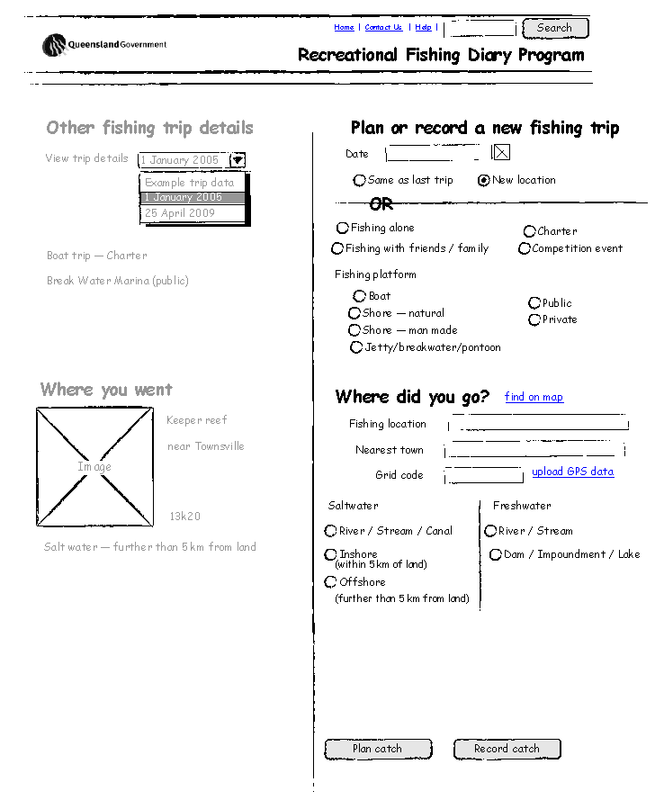 At the moment, recreational fishers can opt in to the diary scheme and keep a logbook of species they catch. These volunteers contribute meaningfully to fisheries management, as I understand it. Nice work citizens! We had hopes this would be an interesting new service. It has some relationship to the SIPS of course, but even more potential as a citizen engagement (or e-engagement, e-government, social networking etc.) For anglers. Smart Service is big into egovernment and engagement, particularly on the GetInvolved website. 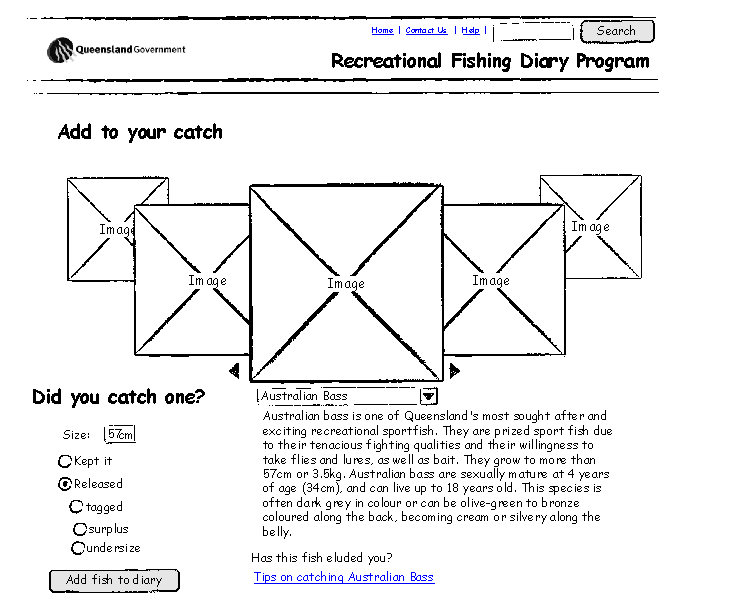 Yes the online fishing diary seemed ideal. A bit like surveys, but trying to really engage, you know? Rather than simply recording data, making it a bit more fun and competitive, maybe even educational. Does data have to be dry and dull? 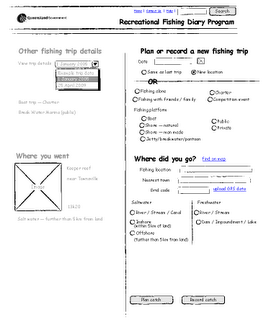 Can you see people that love fishing enjoying typing data into websites? Let’s take a leaf from gaming — people love stats and achievements! Sadly it was canned. Boo hiss! I’ve been meaning to write this eulogy since then. 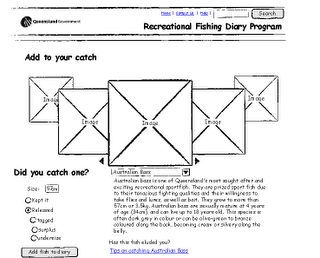 Alas ye online fishing diary, put aside before you truly had a chance to shine. Posted on 25 November 2009 Categories UncategorizedLeave a comment on Go fish!